Digital nomads are people who work remotely at their own accord. They are typically bloggers, web developers, writers, etc. that only need their laptops or phones to work. As convenient as it sounds, being a digital nomad can be overwhelming at first because they usually work and travel to places they consider as comfortable workplaces. For budding digital nomads in the Philippines, it might be best to go and work at a serviced apartment near Manila. However, you must make sure that the serviced apartment has all the things you need as a digital nomad in order to be as productive and as comfortable as you can. If you’re not yet sure about what you need, then these are some of the qualities a serviced apartment should have for all your digital nomad needs. As a digital nomad, the internet is your main source of income. All your transactions, all your clients, and all your efforts are transmitted online. You live online and internet is your best friend. Make sure that the wifi signal is strong and stable enough so that it won’t hinder your work. As the base of your work, it is imperative that you should confirm that the place you’re going to stay in has this for you to even consider staying here. You should consider the places where the apartment has strong internet. Is it in your room? Or in a public area? Wherever it is make sure that it is accessible 24/7 because as a digital nomad, you don’t have specific hours of work. The serviced apartment you’re going to stay in should be near places that you know you will frequent too. Are you a travel blogger that is currently trying to write about a certain hidden gem in Intramuros? Then, look for serviced apartments in Manila. Will you do online tutoring and need a place where there would be as little noise as possible? Look for a more secluded serviced apartment. Make sure that the place you’re going to stay in is a place where you can comfortably do your job in peace. As a digital nomad, you have the perk of travelling from one place to another so be sure that the serviced apartment that you stay in can give you the taste of the culture of the place and gives you access to transportation and other tourist attractions. Serviced apartments are not cheap. It would be better to look for those that would be worth every peso that you are going to spend while staying there. Some serviced apartments have complimentary drinks and food on arrival and for someone on a budget, these little things will help. Some serviced apartments have deals with local facilities and amenities. They could offer you things from gym memberships to restaurant promos or maybe even a deal for you to be toured around the area. Whatever your budget is, make sure that you stick to your budget and choose a serviced apartment that will not make your pockets empty at the end of your stay. As someone living away from their home, digital nomads may find it hard sometimes to be comfortable while they work and travel at the same time. See to it that the bed is as comfortable as it gets to ensure some rest and relaxation. An advantage of working in a serviced apartment is that when you’re in the right one, you will feel as if you’re at home since the setting is almost the same as anyone’s home. Working in the comfort of your own “home” will make it a lot easier for people to do their jobs on the go. Overall, serviced apartments should be your home away from your home. It is a place for you to work as a digital nomad and a place for you to relax as a traveler. There are many serviced apartments in Manila and around the Philippines. All of them have their own quirks and advantages. 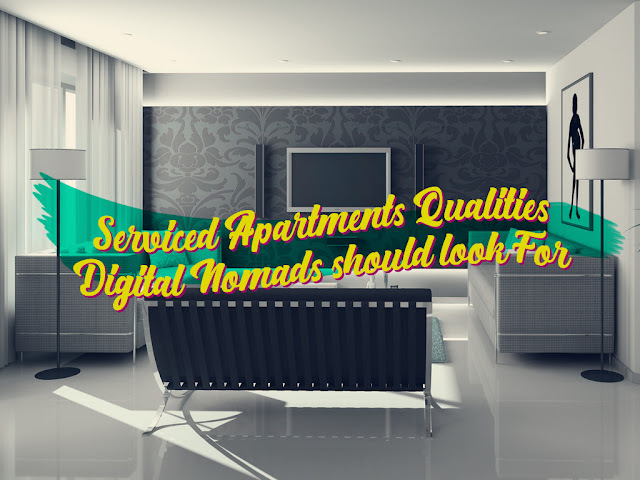 But serviced apartments that have the qualities listed above are definitely places that digital nomads must stay in if they so choose.